Power strips for travelers don’t get much thinner than Powertech Industrial’s Ultra Slim Power Tap, which measures a mere 1.1 centimeters (not quite half an inch) thick. 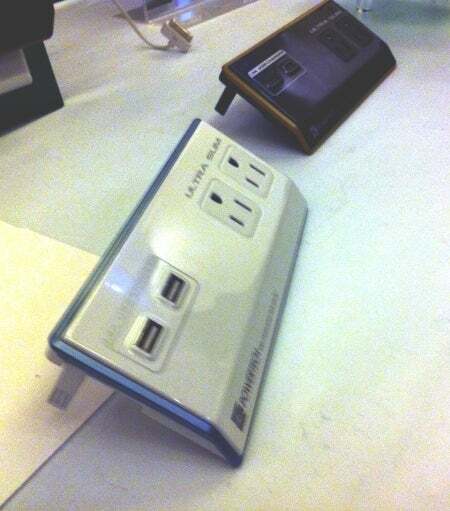 The strip has outlets for two standard US plugs as well as two USB charging ports. However because the prongs of the plugs themselves are thicker than the strip, it has a spacer that prevents it from lying flat against the socket and surrounding wall. Otherwise, you wouldn’t be able to fully insert the plugs. Powertech Industrial is based in China. It expects to ship the Ultra Slim Power Tap this summer; price has not been set.